Gerald Mwangi stands in front of his new home that he built with proceeds from his hauling business. Nyandarua County, Kenya—When Gerald Mwangi’s daughter died from HIV-related complications, Mwangi was distraught and overwhelmed at the prospect of caring for his five, now orphaned grandchildren. At 64 and jobless, Mwangi was uncertain about how he would manage. “I have eight children [of my own] and although most of them are now adults and independent, I had to accommodate my grandchildren for they had nowhere else to go,” he explains. But Mwangi received the support he needed through the U.S. Agency for International Development’s APHIAplus KAMILI project, which is implemented by Jhpiego and nine partner organizations including the African Medical and Research Foundation (AMREF), Kenya Red Cross, Christian Health Association of Kenya and others. In collaboration with the government of Kenya, APHIAplus KAMILI works with local governments to strengthen existing health services and programs that seek to improve health outcomes for the poor, marginalized and underserved Kenyans who are impacted by HIV/AIDS. Through a complement of local organizations, the project supports more than 1,000 health facilities, 400 school programs and 200 community units and works to integrate maternal, newborn and child health, nutrition, water and sanitation interventions. For Mwangi, APHIAplus KAMILI offered the chance to get healthy and provide for his five young grandchildren. As part of the project’s Orphans and Vulnerable Children (OVC) program overseen by AMREF, staff from the local implementing partner in Nyandarua County, Broadvision, visited Mwangi’s home to assess his needs and determine how best to support him and his grandchildren. “Immediately after the visit, my grandchildren were enrolled in the Orphans and Vulnerable Children program,” he recalls of their initial visit in 2010. Through this program, children ages 4 to 14 receive support to meet their housing and nutrition needs, enroll and attend school, stay healthy and receive psychosocial counseling. The family also receives blankets and school uniforms for the children who are attending school. As the caregiver of his grandchildren, Mwangi was enrolled in the Household Economic Strengthening (HES) program. “I used to visit Broadvision’s offices to discuss business ideas that could alleviate my poverty. Furnished with all the information, I cherry-picked a donkey and a cart because I felt this would generate adequate income,” Mwangi says. Mwangi’s family is among the 4,910 Kenyan households and his grandchildren are among the 140,000 orphaned and vulnerable children who have benefited from the HES and OVC programs and their focus on providing income-generating opportunities and activities for participants. Caregivers like Mwangi are provided with funds to strengthen job prospects or start small businesses that will lead to their economic independence. For example, beneficiaries have opened hairdressing salons and tailoring shops, raised livestock and begun farming vegetables and grain. To further assist caregivers as they move toward a sustainable income, the program provides support for village savings and loan operations and other means to ensure that participants have cash for day-to-day survival. These activities are paired with economic literacy skills in marketing, stock management, profit-loss management and record keeping. Thanks to the APHIAplus KAMILI program, Mwangi is achieving his dream of providing for his grandchildren and large family. After receiving the donkey and cart in April 2014, Mwangi started providing transport services in the area. At one point, he acquired a contract to haul construction materials to a commercial building site in the nearby town of Engineer. “I was very excited for this opportunity and I gave it my full dedication. With time, I purchased two more donkeys and an extra cart from the proceeds,” Mwangi says. Through Broadvision, Mwangi learned the financial skills to manage his money and new business. He kept proper records and saved the money he earned. “My dream was to construct a spacious, permanent house for my now large family because I live in a tiny mud house. All my savings were dedicated towards this dream. 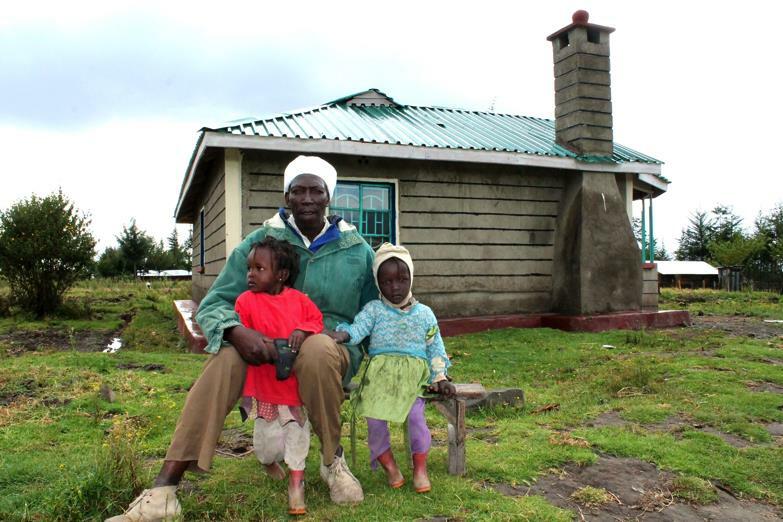 As you can see, the house is now complete,” Mwangi says proudly, sitting outside his sturdy concrete home with the shiny turquoise tin roof. The proceeds also enabled Mwangi to invest in livestock that yields milk for sale. “I can say many things about APHIAplus KAMILI. But one thing that has touched and changed my life is the acquisition of economic independence status. I will now provide for my family in a sustainable manner,” Mwangi says.